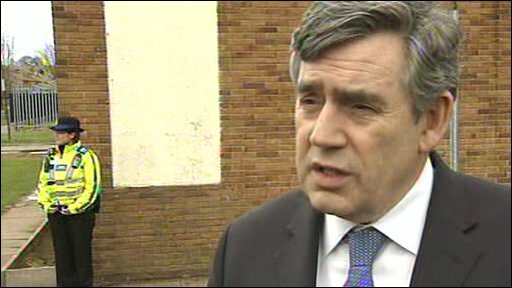 Gordon Brown has said Pakistan needs to do more to root out terrorism after police thwarted a suspected al-Qaeda bomb plot in north-west England. He spoke after police were forced to bring forward arrests of 12 suspects, 11 of them Pakistanis, after a security blunder by Britain's anti-terror chief. Assistant Commissioner Bob Quick resigned after he was photographed with clearly visible secret documents. Pakistan says it already does enough to help and that the UK must do more. Mr Brown said police had to move early to foil "a very big terrorist plot". 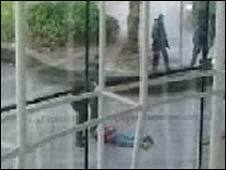 Police have described press reports of potential targets as "pure speculation". Thousands of Pakistanis get visas to study in the UK every year, although the government has recently introduced measures to tighten up the application system, such as finger-printing. Educational institutions have to demonstrate they are keeping track of foreign students. And British officials say 80% of student applications in Pakistan are initially rejected, although some of these decisions are overturned by an appeals process. London has developed relatively good counter-terrorism cooperation with Pakistan. In this case too, Whitehall has indicated that Islamabad has been helpful. Gordon Brown however has repeated that Pakistan must do more to root out its militant elements. For the Pakistani government, citizens who may be exporting radical Islam are a problem. But an even bigger challenge is an Islamist insurgency which the President has said threatens the very survival of the state. However, the BBC's Nick Ravenscroft said: "Privately, sources have confirmed that, in their searches, police have recovered photographs of popular Manchester locations." These include two shopping complexes - the Arndale and Trafford Centres - the Birdcage nightclub and St Ann's Square. An attack could have taken place "within days or weeks", he added. The prime minister said he would speak to Pakistan's president to raise concerns about what he termed "increasing" terror links between the country and the UK. He suggested Pakistan must improve efforts to root out its militant elements. "One of the lessons we have learned from the past few years is that Pakistan has to do more to root out terrorist elements in its country as well," said Mr Brown. There have also been calls to toughen up security checks on foreign students after it was revealed most of the Pakistani nationals arrested in Wednesday's raids had travelled to the UK on student visas. But Pakistan's High Commissioner to the UK, Wajid Shamsul Hasan, told BBC's Newsnight that his country was arresting people in anti-terror raids "every day". "It's at your end, you have to do something more," he said. "If [the UK government] allow us to make inquiries... ask us to scrutinise people who are seeking visas, we can help them. "We have spent so much money out of our own budgets - denying people education and healthcare - and we are expected to do more." By Thursday evening, 14 properties in Manchester, Merseyside and Lancashire had been "deep-searched" by forensic teams and police had started their interrogations of the 12 suspects. But they did not reveal the target or other details of the alleged plot. However a source close to the counter-terrorism investigation, known as Operation Pathway, told the BBC the arrests were made because police believed plans for a "very, very, big attack with possible al-Qaeda links" had reached their final stages. BBC security correspondent Frank Gardner said the plot could possibly have involved an explosive device, but so far the signs were that no device had been built. 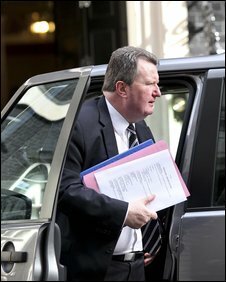 Mr Brown revealed police had been following the plot "for some time", before Mr Quick accidentally revealed a document about it to press photographers as he arrived for a briefing in Downing Street. Fearing their anti-terror operation could be compromised, armed police then launched their raids earlier than planned - stoking criticism that the daylight arrests in cafes and outside a university library may have endangered members of the public. Mr Quick resigned his post on Thursday morning saying his mistake "could have compromised a major counter-terrorism operation". He added: "I deeply regret the disruption caused to colleagues undertaking the operation and remain grateful for the way in which they adapted quickly and professionally to a revised timescale." Mr Quick's blunder later led to questions over whether photographers in Downing Street should be subject to stricter controls over what they are allowed to photograph. Former Home Secretary David Blunkett told the BBC it was right to ask "what restrictions might have to be placed on what is taken, and how, and when". Greater Manchester Police Chief Constable Peter Fahy dismissed suggestions that targets in Manchester had been identified as speculation. "There is no particular threat against locations mentioned in the media," he added. Mr Fahy refused to reveal the alleged target of the plot, or what was found inside the properties raided by police on Wednesday. He also refused to confirm a reported al-Qaeda link to the alleged plot. He said: "We are evaluating all the material we are finding, interviewing people and the investigation will take a long time." Government figures show that 42,292 student visas were issued to Pakistani students between April 2004 and April 2008. Community cohesion minister Sadiq Khan accepted visas were "our issue" and that student applicants were now being dealt with through a "points-based system". He told Newsnight: "There are lots of checks to take place before they come. "We've changed the rules so you've got to be applied to come to a registered university or college before you can come and you have your fingerprints taken and you are biometrically tested." He added that prospective students were checked against lists - which the Home Office described as "immigration, terrorist and crime watch lists" - and that entry clearance officers could interview them to check whether they were really coming to study. However, Mr Khan admitted he did not know how many student visa applications had been refused on security grounds. Tory shadow home secretary Chris Grayling called on the government to "urgently step up" background checks on students coming to Britain from countries - like Pakistan - which have been linked to terror. Mr Grayling said: "Given these latest revelations we need to urgently step up monitoring of applications from parts of the world where we face terror issues."